These pages give brief information about Portugal to whet the appetite and to encourage you to visit this beautiful country. It is a personal view and definitely only represents the perspective of the writer. Question : Did you enjoy it? Reply : Yes, very much indeed. Question : Where is Portugal? Reply : I don't know, we flew there. Prior to the 1500's, Cabo Sao Vicente (Cape St. Vincent) on the Southwest corner of Portugal used to be called "The end of the world". This was because it was the westernmost part of the then known world which was believed to be flat. It was thought if you sailed out of sight of land you might fall over the edge of the world. Most visitors know Portugal through the mass tourist area of the Algarve, a land of hot sunshine and little rain with the houses and names reflecting the fact that it was ruled by the Moors for centuries. Unfortunately, the delightful fishing villages are now hard to find in the concrete jungle. A very different Portugal is found in the north. This is an area of Celtic people where you can find some of the most beautiful landscapes in the world. An area of craggy mountains, endless beaches and productive valleys. The area, Costa Verde, well justifies its title, The Green Coast. Between these two extremes is an area of wide open plains, dotted with olive trees and cork oaks. Scattered around this area are some beautiful towns of great historical significance with their castles, churches and palaces. In this central area is situated Lisbon, the capital city, which, between May and September 1998 hosted 'The Last World Exposition of the XXth Century' - EXPO'98. Porto (Oporto), further north, is the industrial centre of Portugal with Lisbon being considered the cultural centre. Perhaps this is the reason why the Lisbon area received twice as much from European Funds, per head of the population, as the northern area. (This is a biased view of residents in the North). In 2001 Porto was European Capital of Culture and the city has been named by UNESCO as a World Heritage Site. For centuries Portugal has been regarded as the land on the edge. This is not only a reference to being on the edge of the then known world but also caught between traditional ways of subsistence living and the high flying technological age. Characteristically the Portuguese charm their visitors with their mild mannered approach. They refer to themselves as the country of the 'brandos costumes' (gentle ways). They are proud of the fact that they abolished the death penalty in 1867, carried out a virtual bloodless revolution in 1974 and do not kill the bull in the bullfight . Although it is still cruel, you must wait for your visit to see the fair fight between man and bull that is the finale of the Portuguese fight before the bull leaves the ring with his harem of cows. The Celts who have given the north of Portugal its colourful celtic traditions and festivals which is also evident in the characteristics of the inhabitants. The Romans who gave the Portuguese their language, agriculture and wine. 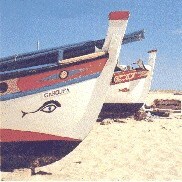 The Moors who gave the Algarve their architecture and style of living and the name of the Region (Al Gharb). The French who gave them their legal system. timber products, resin, machinery, appliances. Portugal (or Portucale) is one of the oldest nations in Europe, first getting its designation as a country in the eleventh century. Its rulers were appointed by the King of Leon before independence was gained in 1143. Much of the period after independence was spent fighting the Moors both in North Africa and on Portuguese soil. Castile in Spain was also a threat but they were defeated at the battle of Aljubarrota by the Portuguese army. Then came the period of the Discoveries and the days of great wealth for Portugal through trading with their colonies of Brazil, in Africa, in India, in China and Japan and in the East Indies. Later religious pressure from Spain caused the setting up of an 'Inquisition' in Portugal. This resulted in the expulsion of the Jewish and Moorish traders leaving Portugal with an empire based on trade but no commercial expertise. The resulting commercial decline was followed by a disastrous defeat in Morocco. Amongst the 8,000 dead were most of Portugal's nobility and King Dom Sebastian (he of the Lagos statue!). Portugal's wealth was spent on paying ransoms for those captured in this battle. With all heirs to the throne killed, the Spanish took over Portugal in 1581. In 1640, a small group stormed the palace and deposed the Spanish appointed governor. The Duke of Braganca became King by popular acclaim. In the late 1600's, gold and diamonds were discovered in Brazil which made Portugal financially strong again but this was all spent on lavish baroque style building which is so enjoyed by many visitors today. In 1755, The Great Earthquake struck, destroying most of Lisbon and many towns and villages from the Algarve coast up to central Portugal. The Marques of Pombal, the Chief Minister took charge with the motto of 'bury the dead and feed the living'. He was responsible for the rebuilding of Lisbon in its present day grid structure. In 1807, Napoleon marched into Lisbon and the royal family fled to Brazil. Under the treaty of Windsor of 1386, the fighting was carried on by British Generals, including Beresford and Wellington, who finally threw him out 3 years later. In return Britain received the right to trade with Brazil direct rather than through Portuguese merchants. Following the exile of the King there were constant struggles between those favouring a monarchy and those wanting a republic, finally on October 5, 1910 the monarchy was overthrown and a republic declared. In World War I Portugal fought on the side of the allies with the loss of many men which was disastrous economically. In 1926 Dr. Salazar became Finance Minister and later 'Prime Minister'. He was dictator until 1968 when he became incapable due to injuries received when his deck chair collapsed under him. He died in 1970 and during his final two years no one dared tell him that he was no longer Prime Minister. The dictatorship, under his successor, was finally overthrown in 1974 in a virtually bloodless revolution but not before many of the young Portuguese men had given their lives in fighting colonial wars in Angola, Mozambique and Guinea-Bissau. After two years of political instability followed during which some momentous decisions were made including the giving of independence to all of the overseas territories. For most countries involved this was a disastrous decision, resulting in civil war and Angola with Cuba trying to replace the Portuguese troops, civil war in Mozambique and East Timor being invaded by Indonesia who massacred more than ten per cent of the population. Beginning in 1975, a strong stable democracy established itself which continues today. In 1373, an alliance was entered into between Portugal and England and, as a result the Portuguese army was assisted by English bowmen at the battle of Aljubarrota in 1385 when they defeated the army of the King of Castile. The following year, the two countries signed the Treaty of Windsor which was to be "an inviolable, eternal, solid, perpetual and true league of friendship". These negotiations were carried out, on England's behalf, by John, Duke of Lancaster, also known as John of Gaunt, who was Protector for the infant King of England. When the treaty was ratified in Portugal, John brought his daughter Phillipa of Lancaster, who then married King Joao I, which was probably part of the original treaty! These two are buried side by side in what is now known as Batalha (Battle Abbey). Their hands are clasped "in the ultimate expression of harmonious relations between Portugal and England". Four of their youngest sons are also buried in the Abbey including Henry the Navigator. This treaty was strengthened by the marriage in 1661 between Charles II and Catherine of Braganca. She gave the Portuguese habit of tea drinking to the English. In 1821, Generals Beresford and Wellington commanded the troops that threw out Napoleon from Portugal. He came back twice so this task had to be done three times! In the Second World War Portugal was neutral but the treaty was invoked by the allies to establish bases on the Azores. During the 1982 Falklands War the facilities of the Acores were again offered to the British Royal Navy. When you drink your next cup of tea, please pause a moment and drink a toast to the Treaty of Windsor which is the longest standing international friendship treaty. For those preferring something stronger, Port Wine is acceptable since the expansion of this trade by British merchants was also a direct result of the treaty. 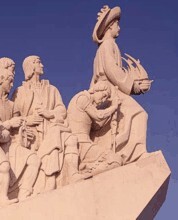 The Portuguese carried out the greatest voyages of exploration and discovery. As a result Portugal became one of the richest nations in the world from the mid fifteenth century to the late sixteenth century. The first to discover South America and Brazil - Pedro Cabal. He had probably been blown off course whilst travelling down the Atlantic on route for the Orient. All these discoveries took place between 1419 and 1500 and were made possible because of the development of the Portuguese vessel, the Caravel, and of navigational techniques under Henry the Navigator's influence at his famous School of Navigation at Sagres. The culture of Portugal is divided between traditional rural cultural events and the international culture of Lisbon. Portugal has its own theatrical tradition and also has many small Museums and Galleries, the best known being the Gulbenkian Foundation based in Lisbon. The foundation also sponsors an Orchestra. Most towns have a cinema which usually shows English language films with Portuguese subtitles. The regions have their own fairs and 'festas'. This tradition is probably strongest in the north where celtic drums and bagpipes play and the villagers, wearing the attractive 'traje' regional costume dance in celtic fashion. The style of singing in the north and also the Fado singing of Coimbra and Lisbon is 'an acquired taste' . Portugal's rich history has left a present day reminder in the exquisite architecture throughout the country including Romanesque, Gothic, Manueline and Baroque. The magnificent Baroque became an eighteenth century symbol of great economic wealth generated by gold and diamonds from Brazil and the sudden development of port wine exports. These buildings virtually bankrupted the country at the time but they are now available for our enjoyment. Manueline architecture is peculiarly Portuguese and is comprised of exotic flowers and vegetation intertwined as a symbol of overseas exploration. Also contained are Crosses of the Order of Christ and armillary spheres which commemorate the influence of Henry the Navigator. Portuguese is a latin language which is evident from the written word but when spoken is entirely different from other western European languages. Surprisingly the Rumanians and the Portuguese can understand each other. A surprise to many, is that Portuguese is the fifth most commonly spoken language in the world. This is mainly due to the large Portuguese speaking population of Brazil, with the addition of Angola and Mozambique in Africa and, East Timor in the Far East. The language, or a variation of it, is Galego which is the traditional language of Galicia in Northern Spain. Unfortunately this language was suppressed in the past but is now making a come back with television stations etc. The trading with Japan, and also the founding of Osaka by Portuguese Jesuit priests have resulted in many Portuguese words in the Japanese language. The most notable is 'arigato' the Japanese word for 'thank you' which comes from the Portuguese 'obrigado' (or obrigada if spoken by a woman). English and German are commonly understood in the tourist areas of the Algarve but in the north French is the second language. This is because approximately 50% of the working population of the North of Portugal is working overseas. Paris is the second largest Portuguese city as measured by the number of Portuguese residents. After the establishment of the first Republic on October 5, 1910 there was a gradual weakening of the economy and also attempts by the monarchists to overthrow the new regime by force. The government during this Republic did not fulfil the hopes of the people and the right wing gained power. In 1928, Dr Salazar became Finance Minister and then Prime Minister from 1932 to 1968. Although his title was Prime Minister he was elected to power by a one party state. A better title is Dictator. Initially, he balanced the country's books but during this long period there was little growth and he retained power with the help of the secret police. At the end of this dictatorship, colonial wars in Angola, Mozambique and Guinea-Bissau caused discontent within the army until finally there was a bloodless coup on April 25, 1974. The colonies were given self rule, without preparation, during the two years of great political turmoil which followed the revolution. However, in the 1980's a strong democracy developed mainly under two strong political leaders of opposite ends of the spectrum, Dr Mario Soares and Dr. Cavaco Silva. The country has recently moved to the left, in common with the rest of Europe, whereas previously there had been a long period of an elected right wing parliament under Dr. Cavaco Silva and an elected left wing President in Dr. Mario Soares. All persons had a champion of their political cause in high office. Portugal is now an enthusiastic member of the European Union. Portugal remains a mainly agricultural economy, but membership of the Common Market resulted in a considerable increase in industrial development. The chief manufacturing activities are textiles, clothing and shoes which were attracted by low labour costs. Nowadays the economy is moving towards machinery processed foods, chemicals, cement and timber products. A large car assembly plant has been built which is producing the 'people carrier' for Ford and Volkswagen. Agricultural and fishery products remain important exports particularly cork products where Portugal is the worlds largest exporter. The export of wines is also substantial. The country also has good mineral reserves including, tin, kaolin, wolfram, pyrites, uranium and compounds of copper, sodium and calcium. In addition, the country is the world's second largest exporter of marble and is also a major exporter of granite. Tourism is an important activity which is centred on the coves and beaches of the western Algarve and, to a lesser extent on the Lisbon coastal resorts. The beauty of the other parts of Portugal are largely unknown even though tourism in Portugal first made its impact in the northernmost province of Minho. As industrialization takes place it is causing an exodus from the villages into the towns. If you want to visit mountain villages where they do not yet use money, do not delay your visit. These villages will die soon now that they have roads, telephones and electricity. They now watch the Brazilian equivalent of 'Dallas' on television, assume that all life in towns is like that and leave to find a better life. In the mountainous areas one half of the working population have jobs overseas. The climate of Portugal, as everywhere is influenced by its geographical location. Being on the west coast of the Iberian peninsular it is affected by the land mass while at the same time being a coastal country, the weather is also influenced by the sea. In summer, when the Azores high is established, there are hot sunny days with the coastal areas kept cool by the Portuguese trade winds (the Nortada) which blows strongly every afternoon. The interior, away from the sea, can get very hot in summer. The Algarve coast is sheltered from the north wind and has the higher summer temperatures favoured by the holiday makers who want to lie on the beach. Winters are mild in Portugal being south of most of the other mediterranean countries. The north has a mixture of rain and sunny days not unlike an English summer. Central areas have gentle dry summers and short mild winters whilst winter in the Algarve is usually dry and warmer than the north. Winter in Portugal is very pleasant without the hot weather many people find oppressive. Everywhere in Portugal at this time of year you need a pullover packed in the suitcase and an umbrella. To the Portuguese food is probably the second most important thing they think about. Meal times are very important, details of the dish that was eaten the day before makes an interesting topic of conversation and the Sunday lunch with the extended family must be attended. Outside the main cities and tourist areas, the food has developed over the years as the Romans started agriculture, the Discoverers found new ingredients and spices and colonists returned from the colonies. The Portuguese eat more fish than any other country in Europe and also more rice (cultivated in Portugal). The tradition of a specific area or village having its own dish remains very strong and the Portuguese will travel for an hour to eat the speciality of that village in one of its restaurants. For example the village of Mealhada has about one hundred restaurants filled by people from outside who come to eat suckling pig. Quantity is almost as important as quality and, especially in the north, it is not usual when ordering a dish to ask if it is enough for two people. High quality food can be found throughout the country. The surroundings are not important, it is the quality of the food that matters. Do have the courage to join the locals in the 'tascas' and try the dishes. For those on a budget, try the dish of the day (Prato do Dia) served at lunchtime in many restaurants. This will cost about 4 euros outside the main cities and will include a glass of wine or beer. The Portuguese restaurants are worth trying but do try the traditional dishes. Be careful if you order a steak and chips since meat is not hung and it is likely to be tough. Portuguese wines are of good quality overall and are inexpensive. It is rarely that you will be unpleasantly surprised if you order the house wine (Vinho da Casa) in a restaurant. In the country areas this may be produced by the restaurant itself and they will be proud that it has not gone through the co-operative and contains no chemicals (used for preserving wine). It presumably has not paid tax either! When faced by a bewildering choice on the supermarket shelf, select a wine from the Dao region and know that all the wine, red and white, will be of good quality. Other regions producing red wines worth tasting are Bairrada and Borba. The most famous of the whites is the Vinho Verde from the Northern region. These are light, crisp, fresh tasting and slightly sparkling, which are excellent with shellfish or even drunk throughout the meal. When ordering red wine it is better to chose one produced in the hotter, drier areas to the south of the country. Be prepared for the Portuguese habit of drinking red wine chilled or ask for it 'natural' which is room temperature. The most famous wine of Portugal is undoubtedly the 'Vinho do Porto' or Port Wine, which is fortified with brandy. The red Ports are usually drunk at the end of a meal but do try the white Port as an aperitif before the meal. White Port is best serve chilled. A visit to the Port Wine Lodges in Vila Nova de Gaia, near Porto is a must for anyone visiting the north. The 'Caves' of all the famous producers are here and a guide will show you how the Port is produced most have an area to sit and sample the product. Many people think that a visit to the smaller, less commercialized, lodges is more rewarding than the well known names on the river front. Going stronger, there are the Portuguese brandies of which the most common is Maceira although many foreigners seem to prefer Brandy Croft. The more adventurous might like to try the aguardente of which Bagaco will certainly give its effect all the way down. Beers are good and strong with Super Bock and Sagres being the two main brands. All drinks in Portugal are cheap. Even Scotch Whisky can be bought in the shops at less than the price charged by airport duty free shops. Every city and town offers a wide range of places to stay at prices considerably cheaper than in Northern Europe. The main tourist complexes are situated in the Algarve coast and, to a lesser extent, the coast west of Lisbon. However, we believe that the Manor Houses of Portugal are the best way to enjoy the country provided you do not require the bustle and discos of the tourist areas. Being house guests of the owners, you get an unforgettable experience of Portuguese life at the top of the social spect. In addition, many Manor Houses have converted the cottages, formerly the home of agricultural workers, into tourist self catering accommodation and these are included on the site. The Manor Houses serve breakfast but only a few offer an evening meal, however nearby there will be a restaurant who will serve mounds of food at a reasonable price. These houses are often in areas of outstanding beauty, and you will have the opportunity of meeting the estate workers and local farmers. These local farmers often practice subsistence agriculture, little changed from the days when the Romans moved their ancestors from their mountain top strongholds to the valleys to produce food for the legions. The larger houses and palaces have been converted to hotels which also provide the luxury of a bygone age. The guest must decide between the more impersonal hotel service compared with the personal friendliness of the Manor House. 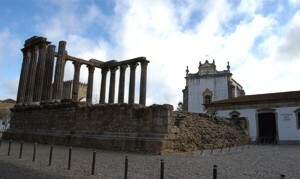 Old buildings have also been converted by the Government into luxury hotels trading under the Pousada href. As we have to give the customer what they want, we have also included a selection of villas near the beaches in the Algarve. There is very little of the Portuguese way of life left on the coastal strip but it is in great demand by golfers and sun worshippers.